A rare and ornamental shrub 6-12' from Western Australia. The leaves are wavy and lightly toothed, feel like sandpaper and are a deep green. 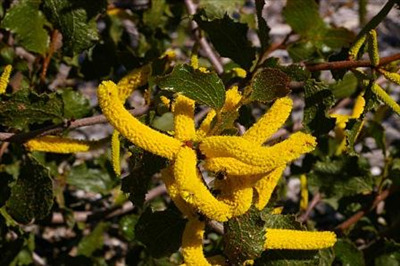 Deep yellow rod-like flowers appear in spring. Recently had success with propagating from seed and the book says can be grown by cuttings. Tip pruning will promote a bushier shrub. Would be an unusual plant for any plant collector. Propagation Information: Difficult to propagate from seed as it doesn't germinate easily. Pour boiling water over seed and let soak overnight. Drench seed with a fungicide to prevent "Damping Off" after sowing.